Winter is finally over and it’s time to get outside. Fargo-Moorhead is full of opportunities to take advantage of a warmer temperature and the beauty of the community during spring. We hike, run, walk, bike, canoe and explore. But there also is time for shopping, dining, art and entertainment. And we never have to travel very far to create memorable spring experiences. Check out 13 fun things to do this spring. There are tons of recreational trailsto get you where you want to go. You can enjoy a great view of the Red River, explore neighborhoods all over Fargo-Moorhead or stroll among the tall trees downtown as you exercise. Several indoor walking pathsalso are available. You’ve got tons of options whether you want a difficult trail ride on your mountain bike or a leisurely jaunt around town on your hybrid bike. 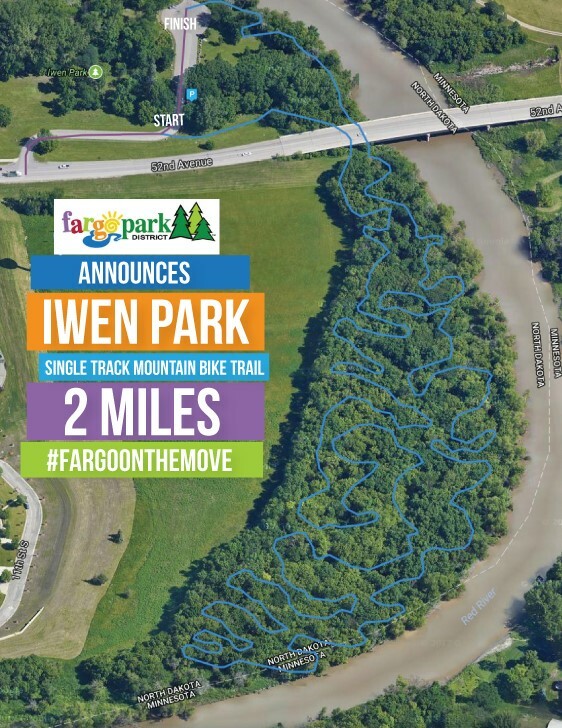 MB Johnson Park in Moorhead has a four-mile, intermediate mountain bike trail,Gooseberry Mound Parkhas a 3-mile intermediate trail and Iwen Parkrecently added a 2-mile course next to the Red River. Leisurely or competitive riders in the city can get a comprehensive list of bike trails from Bike FM. Our students also can get their biking in through Fargo’s bike share program. There are 11 stations with 100 bikes that can be rented through an on-site kiosk. It’s only $4 an hour. Downtown Fargohas great food, shopping, an historic theatre, a museum and a beautiful large park. About a mile-and-a-half from campus, downtown Fargo bustles with energy and activity. The Fargo-Moorhead RedHawksare an independent league baseball team that plays on campus at Newman Outdoor Field. Games start in late April. Many in the community relish the chance to soak up the sun in a fun and entertaining atmosphere. Take a colorful Instagram selfie or admire the great locally-produced art at interactive murals in downtown Fargo. Art Alley is located at First Avenue N., between Fourth Street and Fifth Street. The alley was designated a legal street art wall in 2015. Even more street art can be found with a little downtown exploration. Be sure to stop for a selfie at the NDSU mural at the Northern Pacific Depot downtown. The zoo is adding a Eurasian Lynx in April. The animals are the most far-reaching wild cats in the world. The zoo also has Red Panda, Gray Wolves, Gray Fox, Otters, several species of exotic birds and more. A fun way to discover all the great things Fargo has to offer in spring is challenging your friends to a scavenger hunt. Download an app and walk though Fargo. You’ll learn about the city’s history, solve riddles, answer trivia and earn points that could put you on the city’s leaderboard. Fargoand Moorheadcombine for eight public golf courses. Competitive golfers and beginners can find a fun course. Thunder Road Family Fun Parkhas mini golf, go-karts, bumper cars, batting cages and indoor Lazer Tag. The swimming pond opens in late May, but there is still plenty to do beforehand. You can camp, go for a hike and check out the native prairie landscape. There are a several shows this spring at the Fargodome, a venue that holds more than 20,000 fans for a full concert. Grammy Award-winning singer P!nk performs on May 4. The Broadway hit musical “Chicago” is scheduled for May 21. The Fargodome also has hosted some of the biggest musical acts in the world, including Ed Sheeran, Taylor Swift Justin Bieber, Garth Brooks, Justin Timberlake and Bruno Mars. Scheels Arena in Fargo holds more than 6,000 for concerts. The venue will host singer Kelsea Ballerini on May 11. The 15thAnnual Sanford Health Fargo Marathonis scheduled for May 18. The course always is a hit with runners and spectators. There also are several fun events in the days leading up to the main event. Outdoor recreation equipment is available for rent at NDSU’s Memorial Union. Canoes, kayaks, tents, sleeping supplies, backpacks and cooking supplies are available to get your spring adventure started. Photos courtesy of Visit Fargo-Moorhead.